Cliff Huxtable is one of the most famous dads in television history. We loved the way he oh so lovingly interacted with his wife and how he doled out advice to his kids—in his own funny and quick-witted manner. As we celebrate the 30th anniversary of The Cosby Show, which debuted on Sept. 20, 1984, The Root looks back at a few of the lessons we learned from Dr. Heathcliff Huxtable. 1. Getting by with only a high school degree is definitely harder than you think. Theo is convinced that you don’t need to get good grades in high school to “get a job like regular people.” Equipped with Monopoly money and a New York City-living budget, Cliff quickly schools Theo on how hard it would be to get by on $250 a week. 2. Sometimes a designer knockoff is better than the original. After Cliff tells Theo that the shirt he bought by high-fashion designer Gordon Gartrelle is too expensive and has to be returned, Denise attempts to re-create the shirt. It’s an epic fail, or so Theo thinks. Just when Theo has given up hope of winning over the girl of his dreams, Cliff tells him that he never returned the shirt in the first place. As Theo goes to grab it, he runs right into his friends, who fall in love with his off-kilter duds. 3. Don't skimp on your next Father’s Day gift. In this episode, Cliff complains to his wife and kids about all of the terrible Father’s Day gifts he has received in the past several years, including a tie, belt and suspenders that all light up and even soap on a rope. So the kids decide to give their dad a few gifts six months early. 4. Call in an expert to help improve your kids’ talents. There was never a shortage of guest stars on The Cosby Show, and Cliff always knew whom to call when his kids needed some help. Vanessa received a private clarinet lesson from jazz great Dizzy Gillespie, and Rudy scuffed up a studio floor when she got tap tips from Howard “Sandman” Sims. And of course we can’t forget when dancer Judith Jamison shows out in the middle of the Huxtables’ living room. 5. Think drinking games are for you? Think again. Vanessa makes a big mistake when she tries her hand at the alphabet drinking game at a friend’s house. Denise comes to her rescue, but the hangover nearly proves to be too much for Vanessa to handle. To rub it in just a bit more, Cliff and company organize a quick game—Rudy included—to trick Vanessa with some tea in shot glasses. 6. You might just have to beg the love of your life for forgiveness. In song. After falling for one of his classmates and damaging his relationship with his girlfriend Justine, Theo takes a bit of advice from his father and begs her to take him back. Sing it, Theo. 7. Be prepared, at a moment’s notice, for your kids to come back home. Cliff and Clair were counting down the days until they would have an empty nest. But on multiple occasions when they thought they were getting one step closer, one of the Huxtable kids would come running back. Theo forgot to send in his dorm deposit for his freshman year. Toward the end of the series, Denise returns home from Africa with not only a husband but also a stepdaughter. 8. Watch what you eat before bed. Cliff notoriously loved hoagies. If he could, he would eat them for breakfast, lunch and dinner. But his decision to have a couple of midnight snacks creates some vivid dreams for Dr. Huxtable. In one dream he is greeted by the Muppets, who are running the hospital where Cliff works. In another he is pregnant (along with Theo, Martin and Elvin) and gives birth to a beautiful 6-foot sandwich—and a 2-liter orange soda. 9. Make a list and check it twice before going to the grocery store on Thanksgiving Day. Going to the grocery store on any holiday in which food and family are combined is a daunting task. On this Thanksgiving episode, Cliff is sent to the grocery store multiple times during a torrential downpour. Of course, after he’s been to the store half a dozen times, the rain clears up as he walks in the door. 10. Your parents may have money. But you, dear child, are broke. 11. There is no keeping your husband from trying to fix the plumbing, the dishwasher or the doorbell. Cliff fancied himself some kind of fix-it man. When the plumbing in the bathroom went awry, he swore he could repair it and hassled the team of plumbers that Clair hired. In one of the recurring jokes in the final season, the doorbell is always broken, even after Cliff attempts to repair it. When the dishwasher breaks, he grabs his tool belt and gets Theo to be his assistant. 12. Always plan an elaborate celebration for your parents. On two occasions, the Huxtable fam pulled off some awesome performances for Cliff’s parents on their anniversary. On their 50th anniversary, they performed James Brown’s “I Got the Feelin’.” And of course, there’s their rendition of Ray Charles’ “(Night Time Is) the Right Time,” one of the most memorable moments from the show’s eight-season run. 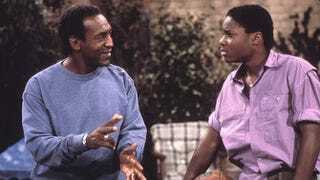 Do you think The Cosby Show is the greatest black TV show of all time? Vote for the Greatest Black TV Shows ever.